X45 is a small belt conveyor system suitable for small products and whenever compact integration of conveyors to machinery and equipment is required. The small belt conveyor X45 offer compact boundary dimensions through compact drive, idler units and tight bends. Product handling is gentle and stable, contributing to high product quality standards and high line efficiency. The design offers a long service life, low noise level and easy engineering. 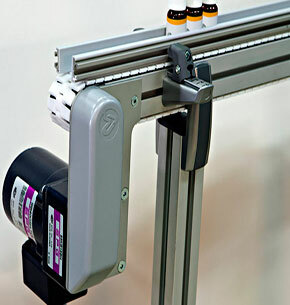 This mini conveyor is suitable for narrow areas e.g. integrated with machines where there is little conveyor space available. Compact and easy to integrate, low conveyor section height. Gentle product handling, smooth chain, gentle to your products. Compact and efficient drive units. Local or central controls for simplified engineering. Easy line engineering through online conveyor system configuration tools. The small belt conveyor’s dimensions is especially suitable for e.g. small ball bearings, batteries, bottles (plastic and glass), cups, deodorants, electronic components, electronic equipment, inhalers, mascara, mechatronics e.g. for cars, perfumes, vials, water pump spindles.